There is a sense of the invisible that pervades the work of Delia Robinson, a sense of the unseen apprehended in her sudden illuminations of ripe political or psychological reality. Her work, deeply felt and somehow joyfully let go of in the same moment, seems to inhabit a personal present that is shaded by a collective and depersonalized history. She manages to leave space for the viewer to participate in pointing the way to a (shared) future. A time-defying collision of the unseen and the ubiquitous has revealed a certain high level of personal and societal conflict, and then given way -- through the artist's pervasive good humour and courage and grace in the face of tragedy -- to creating a space where one can live. Painterly marks and transparent washes free up narratively precise found-photos or fragments from drawings. 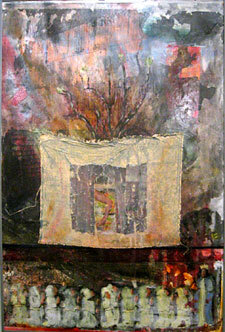 Her often annotated titles -- unpretentious windows into her process -- invite the observer into the life of these paintings. This is not to say that there is not a strong sense of art history also present here. You can feel the presence of a Giacometti's intense struggle for the realization of the human form, as well as the wisdom of a Monet giving way slowly and gracefully to his blindness. Elements of classical architecture evoke the Italian Renaissance. There is often a sense of an over-arching mythic political and Darwinian struggle for power -- and how it dominates the life of the tender and lonely and vulnerable human being. This struggle is counterbalanced within each piece by an ethereal and comparatively sur-rational steadiness of just . . . breathing the next breath, taking the next step. 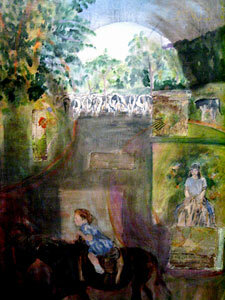 Whether on the global level of international war or on the deeply personal level of a moment of longing, either for deliverance from suffering or for the emotional fulfillment of a new and loving intimacy, which might be either requited or hopeless fantasy, her pictures convey a multi-levelled simultaneity of dreamlike self-awareness. Robinson's representations of complex thinking -- maybe of thought itself -- help the viewer to leap acrobatically over or through a corporatized, media-filtered reality so common as to have become -- almost -- unnoticed. Brilliantly "architected" domes and Medieval monastery-inspired arches are brought to us in dramatic perspective. In one we look down dizzyingly as if we are floating on the domed ceiling. In another, water and wind-worn outcroppings dominate places, as Robinson has said, "where enormous forces have been at work." The articulate imagination of the artist defies the range of possibility of mere words, and that is why these images must be seen, why they deserve to be given an hour of your day. The show includes innovative sculptural paintings and winged forms on Styrofoam panels. 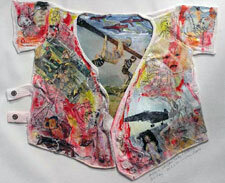 One of the most haunting objects in this show is a toddler's white garment, a piece called "Baby Shirt," which incorporates death images from a medieval manuscript that merge -- in a searingly ironic visual fugue -- with images from the Iraq war of a child hanging upside down from the long gun barrel of an abandoned tank. The photographic image has been painted over somewhat, so that its photo-realist quality has become impressionist. The child's hanging position could be one either of play or of being tortured. We are asked to decide which it is. In that not-knowing, we are triggered into a narrative process which is deeply disturbing, as it essentializes questions concerning the legitimacy of this war, and of war itself. The horror of the baby's death is underscored by the possibility that flayed skin has been used as part of the assemblage. Robinson's paintings, drawings, and shaped Styrofoam paintings often find their structure in the remnants of medieval drawings of celestial geometry submerged into her "damaged" surfaces. Personally, I feel very closely allied to this conceptual approach to the apprehension of a developmental self. So might any viewer who is willing to become temporarily suspended in time and place; brought to the edge of imaginative faculties; made painfully and humorously aware of interior struggle. Robinson is a seasoned artist in her genre, having presented 25 one-woman shows during the past 15 years, yet the pieces are moderately priced. Her work has notably been exhibited twice at the Vermont State House in Montpelier and can be seen at Gallery in the Woods, 145 Main Street, Brattleboro through October 31. Preview at www.galleryinthewoods.com. 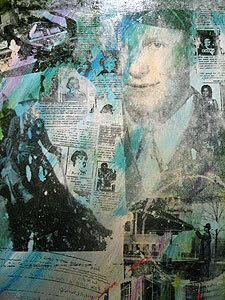 Jerome Lipani is a multimedia artist who lives in Calais, Vt.